A world class resort, ranked by many in their global top ten. Capital of the 4 Valleys ski circus. Wide ranging facilities for skiers and non-skiers of all kinds. When will it snow in Verbier? The next notable snow forecast for Verbier is 2cm1in, expected on 19 April, with around 10cm4in forecast over the next 7 days. The Swiss Ski Resort of Verbier is part of the Four Valleys ski area with access to 412km256 miles of downhill skiing, with 205 marked pistes, served by a total of 92 ski lifts. In addition to the skiing in Verbier itself (412km256 miles of pisted ski runs), the appropriate ski Lift Pass will allow you to ski or snowboard in the other Four Valleys ski resorts of Bruson, Evolène, La Tzoumaz, Nendaz, Siviez, Thyon les Collons and Veysonnaz. Verbier is one of the world's greatest ski resorts and is ranked by many experienced skiers in their top 10, or top 5, or even number one. The resort has it all; a huge ski area with a vast vertical, topped with a glacier ; an authentic Swiss village with chalet-style architecture and great mountain scenery above and action-packed night life with excellent off-slope facilities. These combined attractions draw skiers from all over the world, but with a far better and wider international mix than many other international resorts with British, North American, German, French, Benelux, Dutch and Scandinavian guests all figuring prominently. Verbier is something of a 'purpose-built' resort, although not in the way most people think today. Before 1925 there were no skiers here, and very few people, what is now the ski area only being used as summer pasture for cattle. The first hotel was built and ski lessons were given two years later and in 1928 Verbier's first baby was born and the resort's population reached three. By the end of World War II, the year-round population was still only 27. Then Government experts declared that Verbier's south-west facing plateau location in the French speaking part of the country was ...one of the sunniest in Switzerland, its climate is dry, with hardly any fog and of great biological and therapeutic value. The first lift, in 1946, was a rather dangerous mechanised sledge-on-a-rope and the resort didn't finally explode onto the international scene until ten years after that. The famous church with its 40 metre (130 foot ) spire that dominates the resort to this day was completed in 1962 and the resort was one of the first to offer a skier uplift of 10,000 per hour by the mid '60s. Today the local figure is over 40,000 sph, greater for the full 4 Vallées pass. The longest possible descent in Verbier is 15km9 miles long and the most difficult run is the 'Gentianes - Tortin'. The 4 Vallées Ski area is one of the largest lift-linked areas in the world and the largest truly-linked and wholly in Switzerland. The maximum skiable vertical, when conditions are right, involves a trail of 15km (nearly 10 miles ) descending more than 2,500m ( 8230 feet) again one of the biggest and best verticals in the world. Experts will be especially enraptured by what's on offer around Verbier. Highlights include the legendary Tortin snow bowl with its huge bumps, the extreme couloirs down from Les Attelas, the steep skiing around Mont Gele and the notorious Gentianes run below the cable car. Ski safaris are organised by the ski schools to French and Italian resorts in the area and heli-skiing is another popular option. Ski mountaineering is yet another of the Verbier's strengths, lying as it does on the legendary 'Haute Route' between Chamonix and Zermatt (6 days). Intermediates inevitably have the greatest choice with hundreds of miles/kilometres of trails in the blue/red category. The huge Lac des Vaux bowl with lifts rising in every direction is one of the many options. Beginners may feel daunted by the skiing mecca all around them, but nonetheless have sunny nursery slopes just above the village centre. Cross country skiers have half a dozen 4 and 5km (2.5- 3 mile) loops to choose from starting in the various Vallées villages, and there is a eight kilometre (five mile ) route through Val de Bagnes. Verbier offers good sking, particularly, for Expert and Intermediate skiers. Boarders' favourite slope is generally regarded as La Chaux and the 1936 Neipark (www.mysnowpark.ch). Verbier hosts one of Europe's best known freeride competitions, unique to Europe, the Xtreme, each season on the north face of the Bec de Rosses, which features gradients of up to 54 degrees. About 30 of the world's best riders (skiers and boarders) are selected, by invitation only, to participate. Usual opening is mid November (May open weekends in November prior to main opening), and usual closing is Mid April. NOTE:- Lift and Piste openings are always subject to Snow Conditions in Verbier. Verbier is able to make snow, on 42km26 miles of ski runs, with 52 snow cannons. The 17 ski lifts of Verbier are able to uplift 41,328 skiers and snowboarders every hour. Verbier is in the Swiss Alps in Four Valleys, Valais, Switzerland. The nearest airports to Verbier are Sion, Geneva and Berne. There are seven airports within three hours drive. Sion is just one hours drive away, in good driving conditions, so you can be on the piste quickly. Verbier's nightlife offers something for everyone but is generally more happening than most of its competitors. Le 71 Point Bar below the Chez Martin restaurant has great music, as does the Crock No Name which is also famous for its Long Island Ice Tea. The large Nelson Pub and the two-level Mont Fort Pub are both famous for being action-packed through to 1.30am. The more laid-back King's Bar serves cocktails, fine wines by the glass, malts and Havana rums and cigars. There are four night clubs in Verbier open up to 4am, the Coco Club is the 1st Luxury Vip members' club in the Alps. Le Farm Club has no dress code but normally has queues if you arrive late. Casbah is a late, late lounge bar and night club which opens just as the other bars are winding down and the fourth choice ius The Coup d'Etat. Teenagers tend to gather at the fast-food and games room Big Ben club near the Medran lift. Want to Know when it Snows in Verbier? 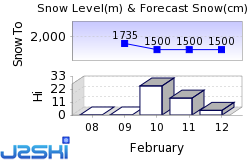 Click above to get Snow Reports by e-Mail for Verbier. By doing so, you agree to Our Rules. 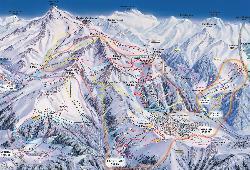 Other popular Ski Areas near Verbier. Ski Hire Shops in Verbier. For current snow conditions, see our Verbier Snow Report. Want to ask about skiing and snowboarding in Verbier? Or contact Verbier Tourist Office. Note :- The information on J2Ski concerning Verbier, where not clearly factual, is opinion only and is neither definitive or exhaustive. Warning :- Snow Sports are Dangerous! Skiing, snowboarding and all winter sports involve risk of serious injury or death. You MUST confirm all information, especially snow and weather conditions, in Verbier before you ski or board. You participate at your own risk.